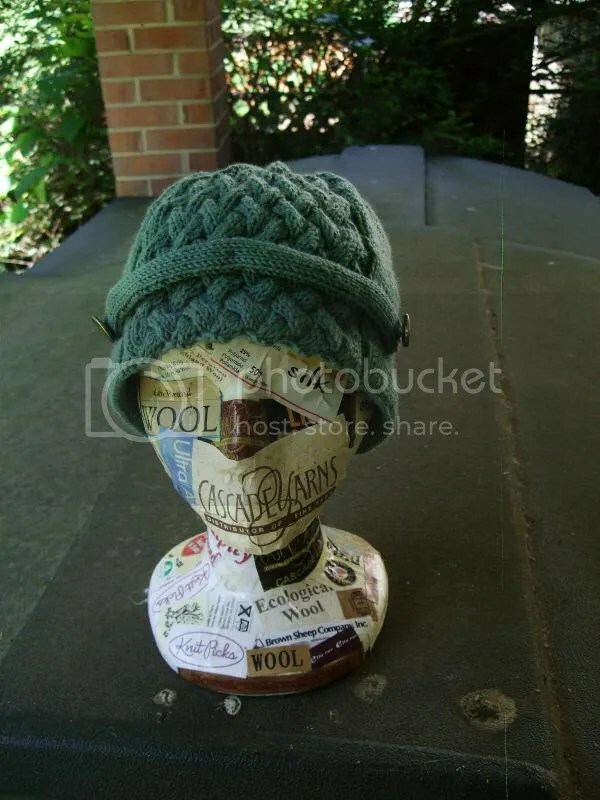 hat | Stitch, Brinn, Stitch! 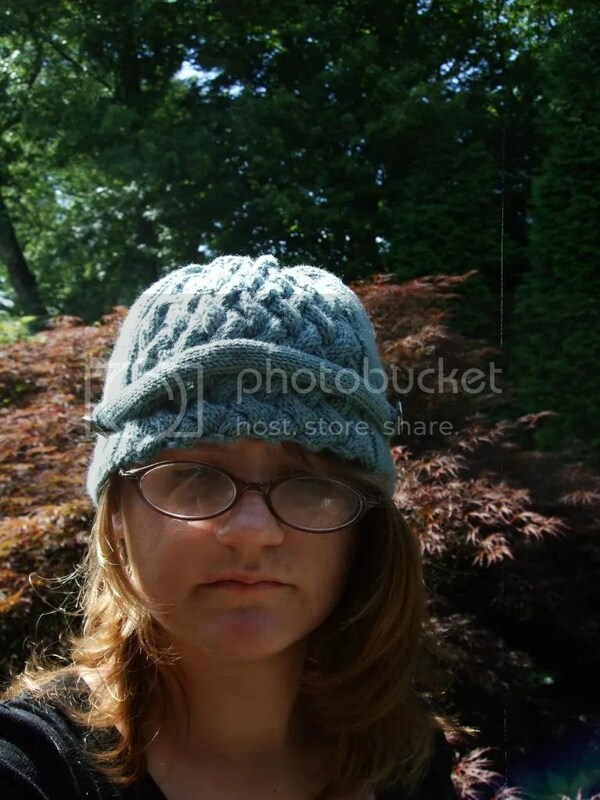 You are currently browsing the tag archive for the ‘hat’ tag. Hats are so fast. They are even faster if you don’t cast on 20 more stitches and get all the way to the beginning of the decreases before realizing that’s not going to fit any head ever, including Andre the Giant, thus doing an amount of unnecessary knitting that would probably make another whole hat and a half. Even with the ripping and reknitting, it still came out a little big. 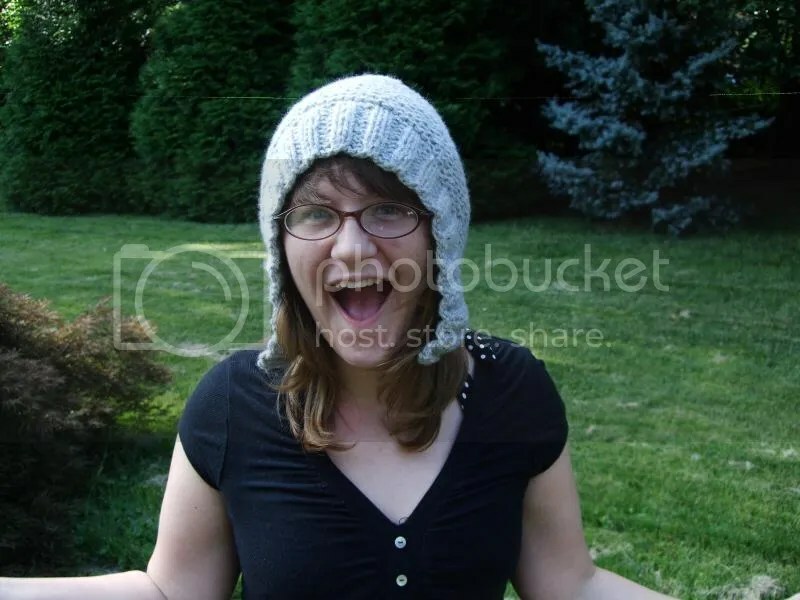 That actually works in my favor though, since the hat is for my brother, whose head is a big bigger than mine. It is a nice little beanie though. I wouldn’t wear it since I don’t really wear beanies (I prefer ear flaps or bonnets because they cover my ears properly), but it’s cute. The goal is to write up the pattern as part of a collaboration that I don’t want to talk too much about yet (counting ones chickens and so forth). I might do a whole set (hat, cowl, mittens) since the amount of stitches I cast on originally would be a great width for a cowl, which I discovered after taking the needle out. It’s been ages since I’ve actually published a design, even though I make up patterns fairly regularly. So that’s happening. Briefly in life news: Move is happening tomorrow! I’m ready in no way other than emotionally, but EXCITE. Day two of NaBloPoMo and it’s another finished object! We’re on a roll so far. Mods: I did a twisted cord instead of garter for the ties. I used an icord bind off for the last 20 stitches and did an applied icord edging for the rest. I’m pretty chuffed with my new hat. It covers my ears really well, and it’s super cute. It took me just a few hours to knit–I started it on Wednesday evening (got about an inch in) and knit most of it at work on Thursday. Super quick. I did have to measure with my hand because I forgot a tape measure. I know my hand is about 7″ from wrist to tip of middle finger, so I knit until it was about half an inch shy of that. Perfect. I took these photos before blocking because I wanted to catch the light (it’s so hard to get pictures of knits during the work week with the days getting shorter and having to work until 5:15). I did block it though. Well, I steam blocked it, which is the most I really ever block anything (except weaving, which gets the whole bath and everything). This pattern ended up being perfect for the yarn. I have a little 30 yard ball left over and who knows what I’ll do with that, but this is absolutely the pattern for this hat. The merino/silk single SHINES in all that stockinette. It’s not my usual color palette (it’s a bit light for me; I tend towards more jewel tones), but it’s MINE. Especially since I paid full retail price for this yarn, and it wasn’t cheap. I don’t feel bad about it though, cause I bought it at an LYS (in Frederickburg) and I like supporting local businesses, plus I like Juniper Moon. I can’t really afford to participate in her CSA (boo! ), but I could buy a ball of Juniper Moon yarn. Coming up on Chez Stitch Brinn Stitch is actually another finished object probably (I’m typing this on Friday and I miiiight be able to finish this project by tomorrow. Which is today if you’re reading this on post day) and I have some pretty yarns to show off. 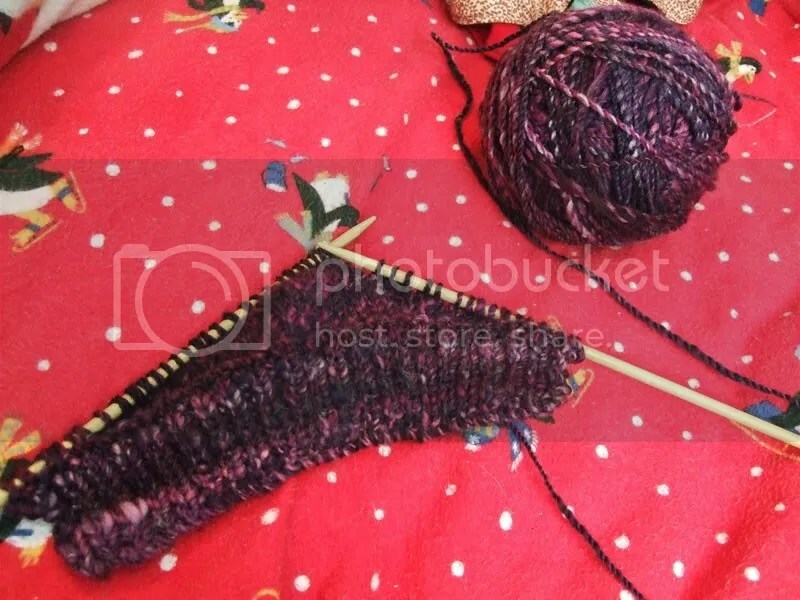 Because (of course) I’m doing more WWFY swaps, and showing off the pretty yarn I get in return is excellent blog fodder when I’m trying to post every day. Who doesn’t want to see yarn glamour shots? No one, that’s who. No one. Or maybe yarn muggles. But probably no one. 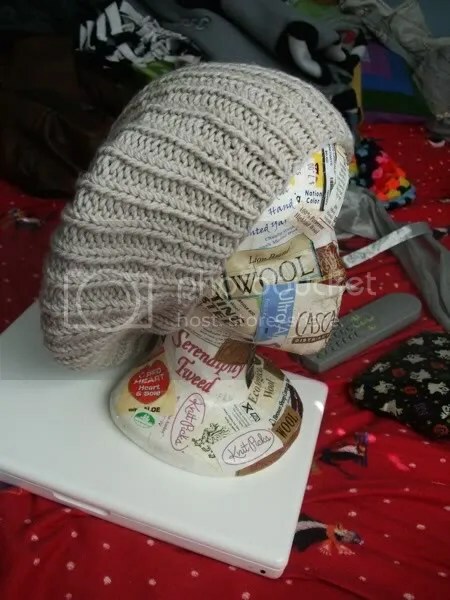 I made a hat! I would say it was so quick that you didn’t get to see a WIP, but I finish things so often (and make so many things) that I don’t have a lot of WIP posts anyway. Yarn: Recycled wool/viscose/cashmere/angora laceweight, which I doubled and navajo plied. Six strands total. Super thick. 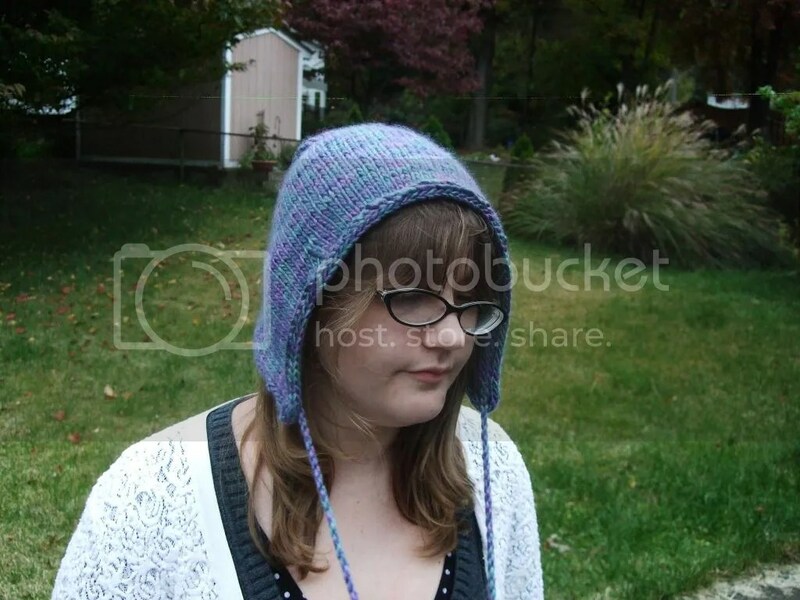 I made this hat in two days, the bulk of the knitting being done in one. Huge yarn and huge needles makes for a SUPER quick knit. The pattern was clear and easy to follow and the change in textures kept things interesting. As if you could get bored with such a quick project. The hat itself is super thick and super warm and I am desperately in love with it. I want fall weather and cold and snow so I can get back to wearing my copious cold-weather knits. I have so many hats and mitts and scarves (OH the scarves since I took up weaving) and sweaters to wear. It has been marginally cooler over the past weekend, but not nearly cool enough. 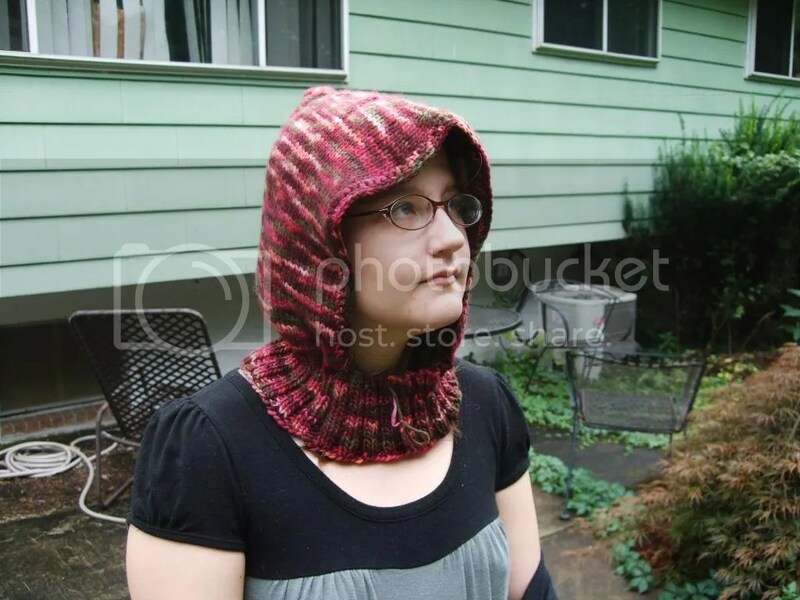 I wanted to make something quick and on large needles, so I made a hood/hat-type-contraption. It’s delightful. Pattern: Made up as I went. 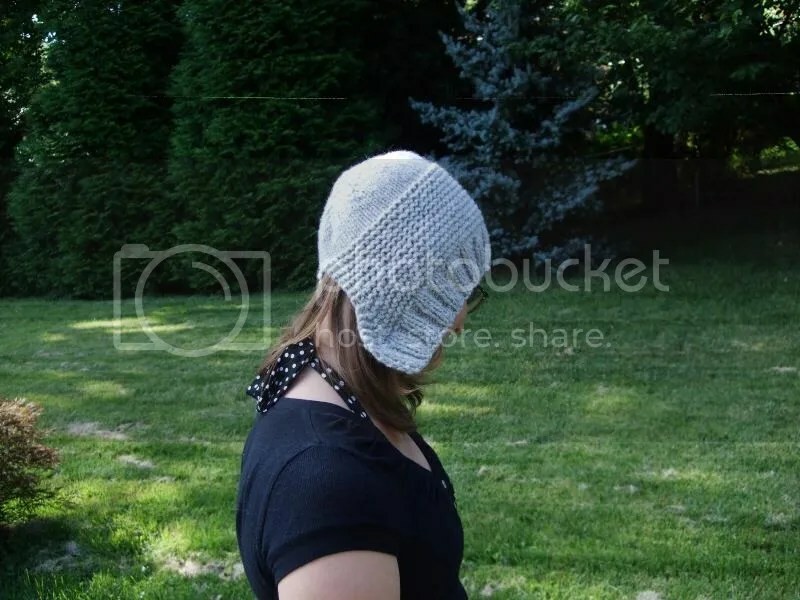 Might do a pattern, but I’d have to knit up another one to work out the kinks. I started out wanting to make Riverbanks from Knitty, but I only had the one skein of yarn, so yardage would have been tight. I also didn’t want the lace, which would have been easy enough to take out. I figured I might as well just make things up as I went. I’m pretty pleased with it. The Malabrigo is incredibly soft and warm. I tell you, all the things they say about the magical softness of Malabrigo are completely true. I wish I could afford to knit with it all the time. But I can’t. Sad face. Anyway, the hood. It came out pretty well for a prototype. 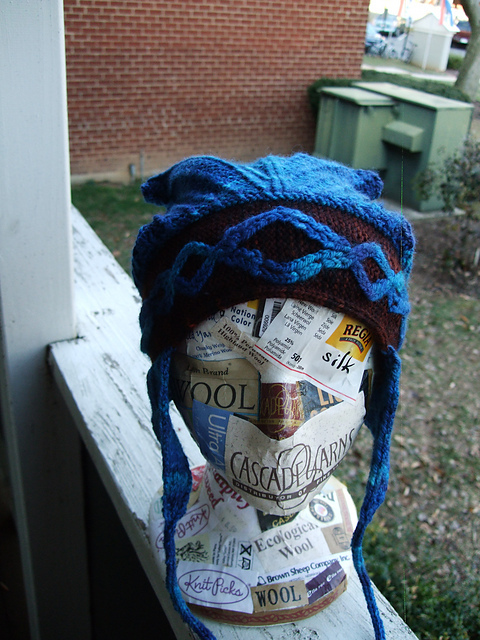 And yes, I could rip it out and reknit it to fix the problems I’m about to talk about, but I don’t want to, so there. Anyway, problems. There are some, owing to the made-up nature of the pattern. 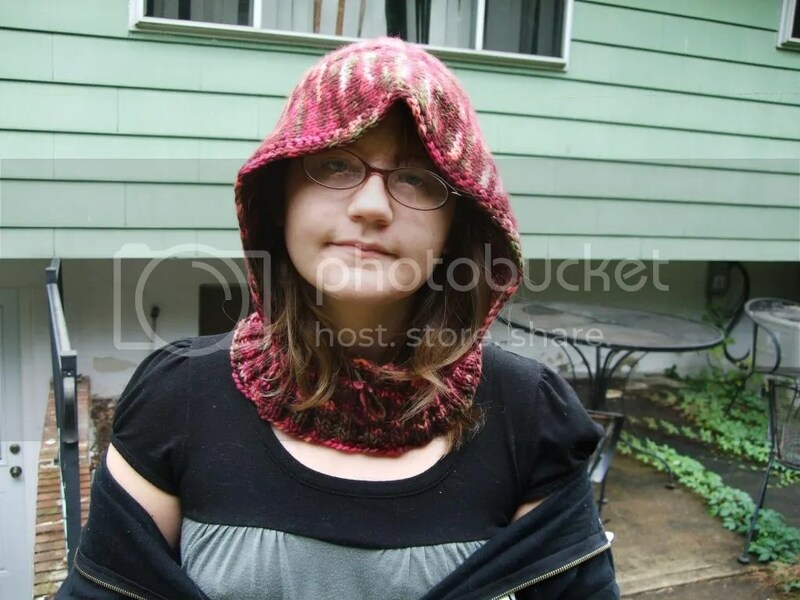 The hood part is a little too long and I would prefer the cowl part to start sooner. There’s a weird bulge in the back unless I tip my head forward, but that’s due to some short rows. 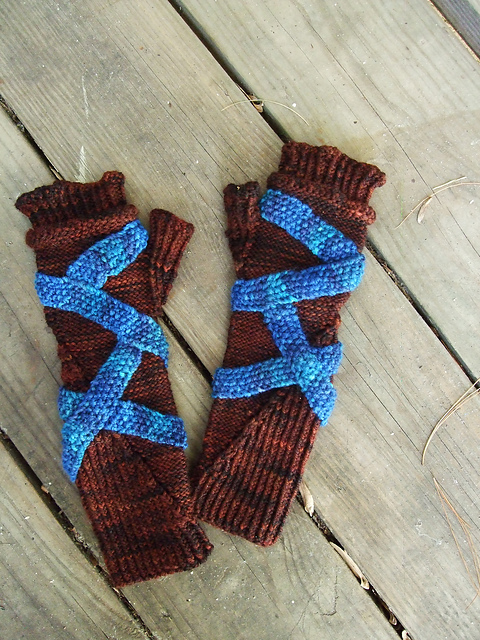 I put some in at the beginning and then didn’t need them, so I balanced them out with more short rows and yeah. The hood is also a little pointy, but I’m not sure how to get around that short of starting in the corner like a beanie. I will definitely be making at least one more out of something equally lovely. Maybe I’ll use the skein of Lorna’s Laces I’ve been hoarding (I got it in a swap). Or something else lovely. In life/fandom news: I am working full time now. It’s exactly as awful as people make it seem, although I’m lucky to be working in a fairly quiet office (for the time being anyway). I’ve been watching a lot of the cooking show Good Eats since I found it on YouTube. I used to watch a lot of Food Network and I always loved this show–it’s about cooking, but it’s also about science. Why cooking things different ways works, why components of food cook the way they do. Very interesting. And great recipes too–I’ve made a couple. I’m also reading The New Rebellion, a Star Wars novel. I’m still making my way through the Expanded Universe, occasionally ploddingly. Joe and I are still reading I, Jedi, although that’s going pretty slowly. Maybe we’ll get back into that this evening. You guys, I am really bad at blogging. Apparently we’re making this a once a week thing because I can’t be arsed to type anything up more often than that. In my defense, I’ve been kind of busy. I work four whole hours a day! And I have to watch Star Trek and make things I don’t blog about, apparently. Anyway, I made a hat. Yarn: Louisa Harding Ianthe, a 50/50 merino/cotton blend. About a ball and a half. Needles: Like fives or something? I dunno. This hat is for the gift box I totally have. (I do not have a gift box. Per se. It’s more of an idea at this point). I have too many bloody hats but no desire to stop making hats and anyway, it looks weird on my head. I don’t really rock a beanie very well. 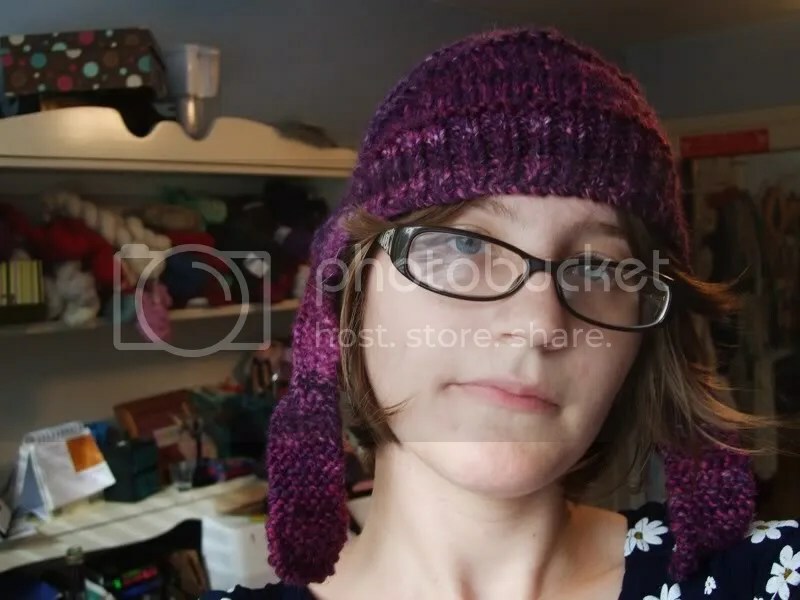 Of course, when it’s cold, I don’t much care what I look like, but it’s 90 degrees outside, so… I still don’t care, but I have opinions on the hat at least. So it isn’t for me. I have no idea who it is for since I don’t know a tremendous amount of people and I’m not really the gift-giving type. They are (I believe) Norwegian military buttons. I got them from a yard sale in a big collection of buttons. I have a bunch of various military buttons, but a lot of them are gold colored and I don’t particularly care for them. The insignia are pretty cool though. In life news: The new job is going really well. Things are pretty slow because of the summer (which is AWESOME) and I wish I was working full time, but I’ll take what I can get. I’d really love to be able to move somewhere that isn’t a basement (or at least an actual basement apartment), but I’m not sure when I’ll be able to afford to do that. In media consumption news, I’m reading Choices of One with Joe. I’m also reading Scoundrels, another Star Wars novel by Zahn, which takes place shortly after A New Hope and right before Allegiance. I finished watching Deep Space Nine (OMG IT IS THE BEST EVER) and have started Voyager. Y’all, you really have to want to watch Voyager. After the premiere, the first couple of episodes are TERRIBLE. It gets much better (I’m a little more than halfway through season two), but even I have to skip a few of the first ones in the first season. And I have a ridiculously high tolerance for crappy television. After Voyager, I’m going to go back and watch all the Next Gen movies, probably starting with Generations. Maybe I’ll watch the original series. I honestly don’t know what I’m going to do with myself when I’ve watched everything in the Star Trek franchise. Start over with Next Gen again, I guess. Anyway, make things and watch Star Trek. It’s what I do. 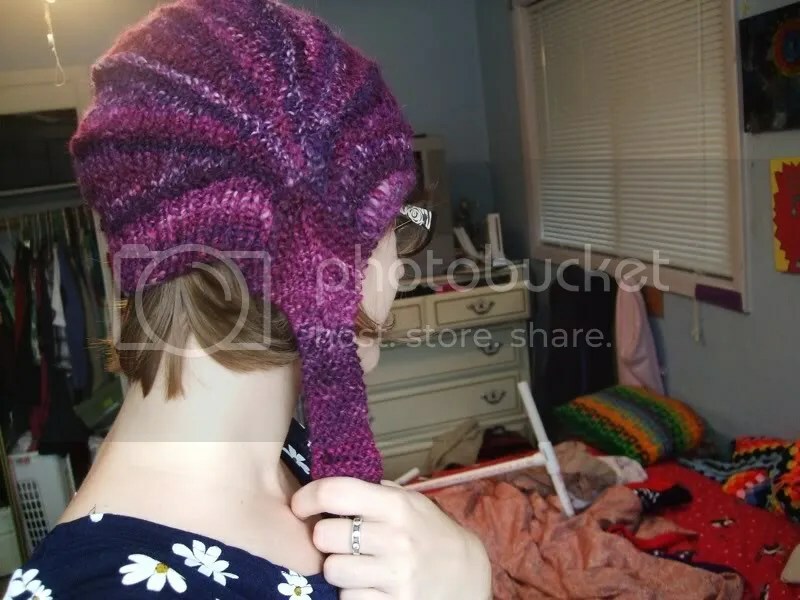 Mods: I did the straight section about an inch shorter, mostly because I was tired of knitting it. I was surprised at how much yarn this took: It’s basically half a sweater. The yarn is fantastic though, soft with a firm twist that held up through frogging bobbles. 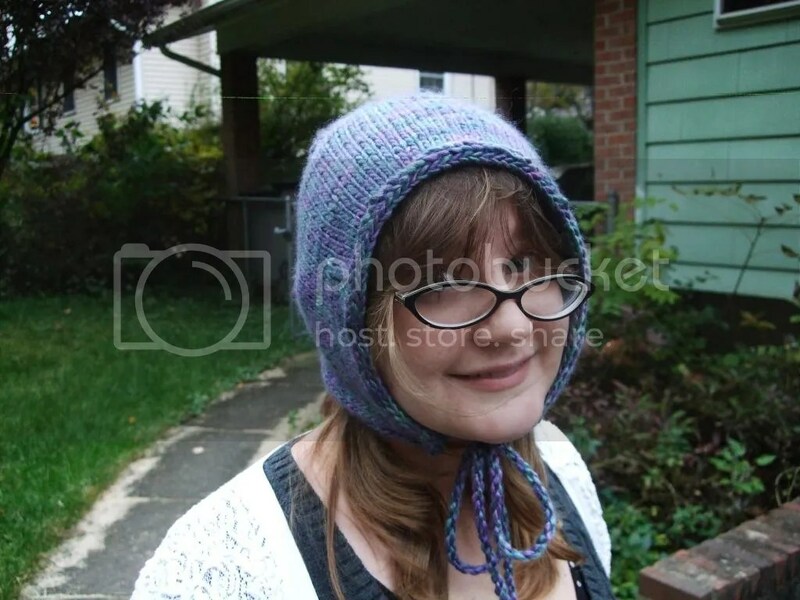 My partner appears to like the hat I made, so that’s another swap success at least on my end. I was worried it came out too big because it looked ridiculous on my head (but I have very short hair and the hat sort of swallowed me up). I based it on a pattern/picture she had on Pinterest, down to the color and everything, so that’s good. Stay tuned for the completed Skew Socks, next time on Stitch, Brinn, Stitch! Mods: I made the largest size but worked seven panels. I also made the straps even since I probably button it. I’ve been meaning to knit this pattern in this yarn practically since I spun the yarn, but things had gotten in the way until now. And it was super fast–I blew through the pattern in about two days. And I totally love it. I love working with handspun, the colors are amazing, and the fit is great. 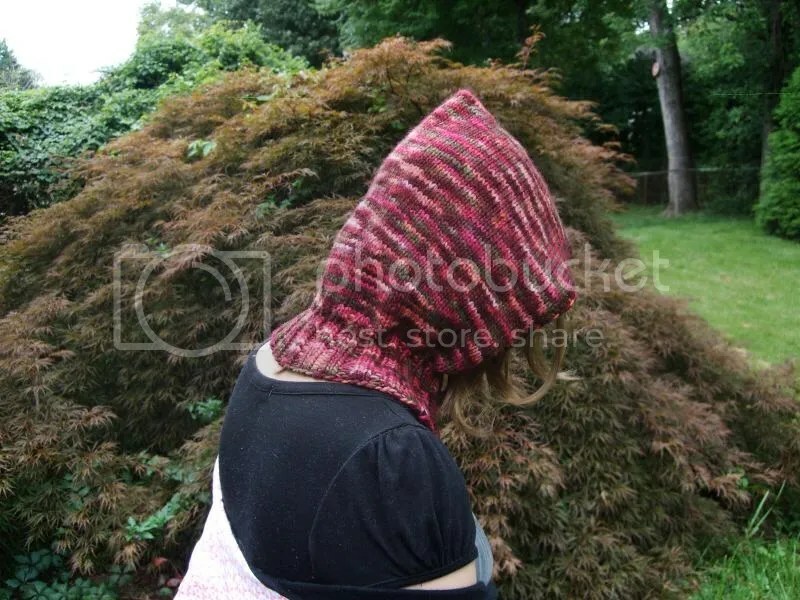 Because of the extra wedges, it sits all the way down on the back of my neck and just above my eyes in the front to keep everything toasty warm if it ever gets actually cold. Which, who knows cause today the high is 77 and I’m wearing a short-sleeved dress. I haven’t started anything new just yet, but you know I probably will soon. I ought to work on the things I already have otn, but starting something new is just so damn fun. This post is a little late, but it’s still today, so it still counts. I may have started another project. It’s Aviatrix in some delightful handspun. At this moment, it’s quite a bit further along (I have four full repeats done), but this is the picture I have. More tomorrow probably. Also, apropos of nothing, this week was the boyfriend and my third anniversary. We’ve been together three years which is totally bitchin. We celebrated today with Mexican food and later this week with a movie date. So yay! Boyfriend! 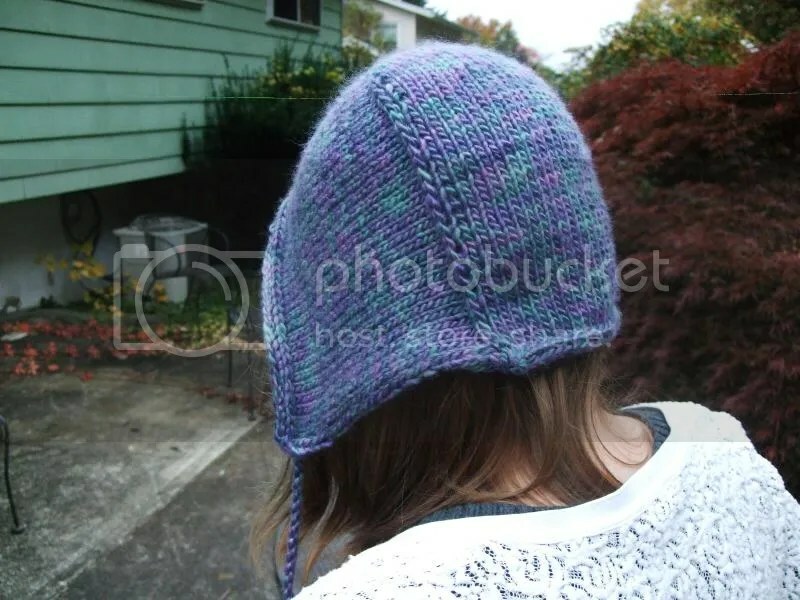 After much testing and editing, I finished and uploaded the pattern for the slip stitch hat I posted on here last week. I’m pretty pleased with it; I hope you are too. 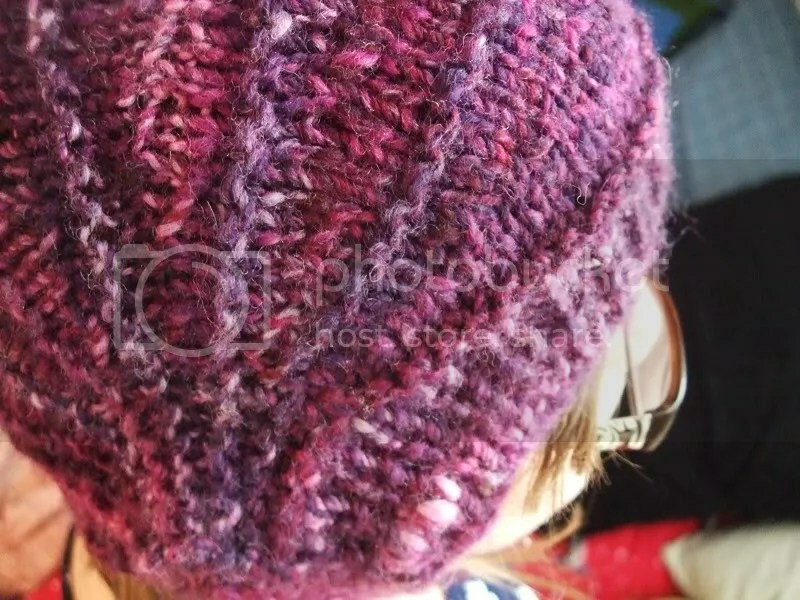 Knit up in practically no time at all, these hats are a great stash buster for leftovers in multiple colors. 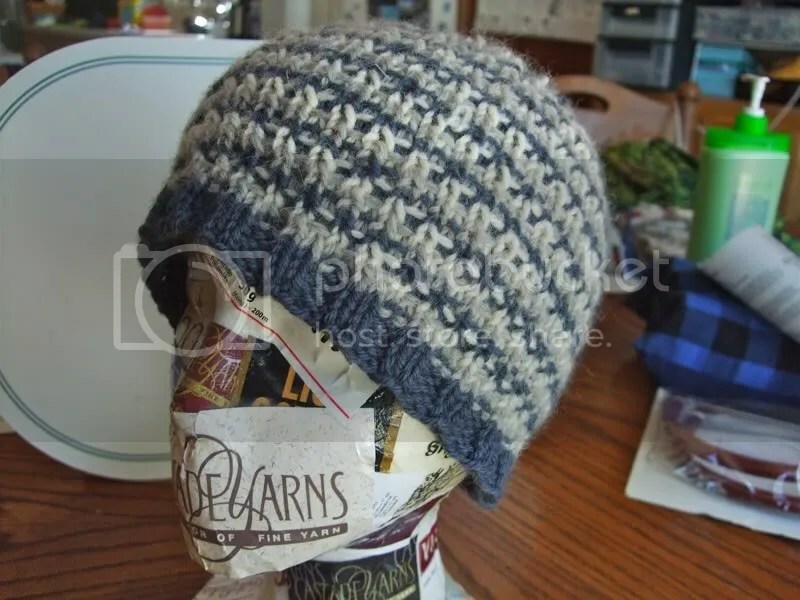 Great for last minute gifts or to keep your own head toasty warm.